We made it through January! A big pat on the back and congratulations to all of you who posted and linked every day for Just Jot it January. It’s not easy for everyone to post every day, so if you fall into that category, well done! And if you just linked once in a while, or even once, or if you went into the comments and read posts of other participants, I appreciate that too. To celebrate our accomplishment, no matter how big or small, I’ve made a participant’s badge. Please feel free to take it and post it on your blog. If you’d like to write a post to congratulate yourself and others for completing the challenge, feel free to link back here. I’d also like to offer this as an opportunity to drop a link to one of your JusJoJan posts into the comments below. I encourage everyone to visit at least one blogger who you might not have read before. Most of all, let’s keep this community going! Keep in touch, visit one another. Have fun! Categories: Blogging, Blogs, Just Jot it January 2019 | Tags: blogging prompt, community, congratulations!, connecting bloggers, inspiration, JusJoJan, WordPress, writing prompt | Permalink. Aaaand, it’s a wrap! The year that was January 2019 is but hours away from its completion here in my corner of the world. Will February be better? I damned well hope so. Having said that, my mother is still in the hospital with pneumonia. I believe it’s going to take her a while to recover from this. I just spoke to her on the phone: she can hardly breathe. I had a lot to be grateful for last year. 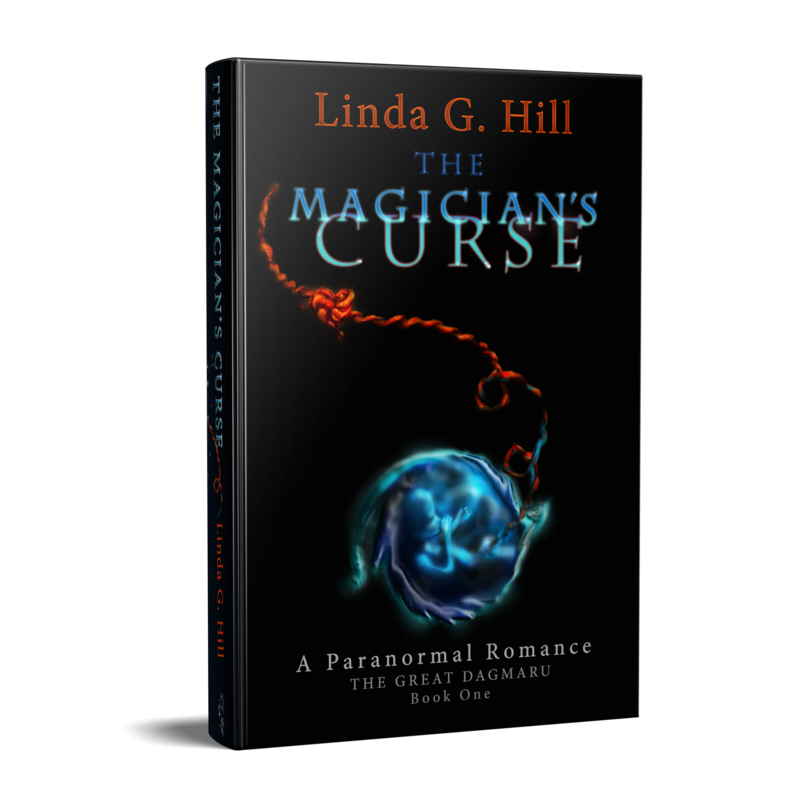 Career-wise, I had my July Bookbub Featured Deal that had me give away 25K copies of The Magician’s Curse. I signed up for it thinking I’d have no chance whatsoever getting it. Bookbub deals are like the lottery. I was flabbergasted when I got the acceptance email! However, it could have been a disaster: if there’s one piece of advice I’d give anyone submitting for a deal, it’s to make sure it’s not your only book, especially if you’re giving it away. Had The Magician’s Blood not been ready to publish, I’d never have made my money back. Bookbub deals are expensive! But so very worth it. One other piece of advice for anyone thinking of having thousands of strangers read your book? When it’s free, some will pick it up and read and review it even though it’s not a genre they enjoy. Not everyone is nice, unfortunately, so make sure you’re wearing your thickest of skins when you read what people have to say. Having said that, I do appreciate (almost) all my reviews! Even the negative ones. The exception being from those who didn’t even read the whole thing before giving it one star. I’m grateful that everyone in my family survived 2018, all of them healthy except that little bit at the end. And even that was temporary. I’ll be back tomorrow with the participation badge and an opportunity to leave links in the comments. More details about that in tomorrow’s post. Until then, stay warm if you’re in the northern hemisphere and cool if you’re Down Under. Categories: advice, Blogging, Blogs, Just Jot it January 2019, Life | Tags: BookBub Featured Deal, family, Health concerns, inspiration, JusJoJan, thank you, writing prompt | Permalink. This is it! 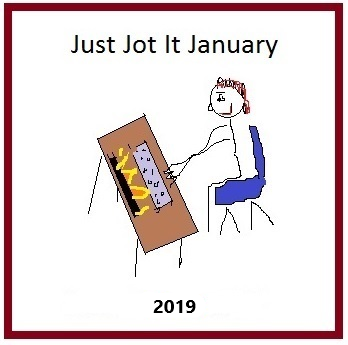 The final day of Just Jot it January 2019! It’s been a bit of a hectic month for me, but I pulled it off, at least getting the prompts out there and jotting every day. More about all that later. If you’d like one last look at the “Rules” post, you can find it HERE. 1. Please be sure to link back to THIS POST for January 31st, 2019. When you realize that you said and heard many one-liners in the last week and you should have written at least one down because you’re gettin’ old and forgetful. 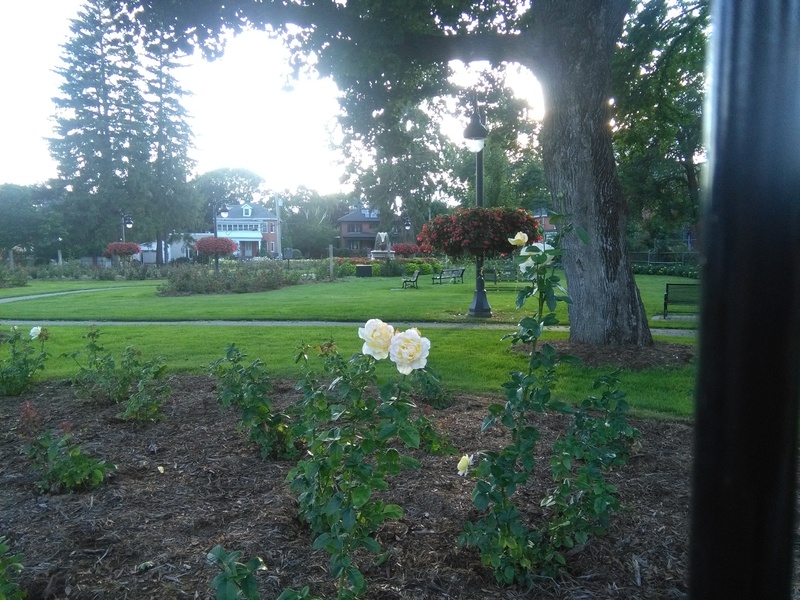 Here’s a random picture of summer, so I can remember what grass looks like. (i) Make it one sentence. (ii) Make it either funny or inspirational. (iii) Use our unique tag #1linerWeds. (v) Use our One-Liner Wednesday badge. 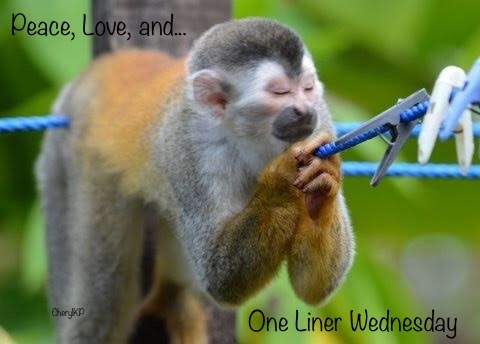 Categories: Blogging, Blogs, Cool Stuff, Funny, Just Jot it January 2019, Life, One-Liner Wednesday, Prompt | Tags: #1linerWeds, Humor, inspiration, JusJoJan, photography, WordPress, writing prompt | Permalink. I’m currently writing the second book of what I hope will be a trilogy that’s set, in part, in a pub that features male strippers. While most people might consider that a book about strippers must be inherently dirty, I’m trying to make it clean inasmuch as everyone is consenting, the characters are just normal people, and there’s nothing forbidden or illegal about what they do. In other words, I’m trying to keep it classy. At the same time, I have to put my characters through some sort of moral torture, just to keep things interesting. I love a story that’s brimming with dilemma, human choices, and all kids of emotion. Though these books are meant to be funny, they’ll be filled with real life situations–maybe not ones that most normal people get into, but that anyone can relate to. It’s a challenge, but a fun one. You know what else is a challenge? My shower. My hot water keeps shutting off without warning or reason, usually between five to ten minutes in. Usually while I have soap in my hair. It comes back on for a minute or two if I shut it off and on again, but because of the positioning of my tankless water heater, it takes a while to warm up. In the meantime, the water is so cold, it hurts. So while I’m not dirty, I have a hard time convincing myself to brave the shower these days. Because while I might be writing books about male strippers, I don’t need a cold shower, thank you very much. The prompt word, “dirty,” for today’s post is brought to you by Jim! Thanks, Jim! To find his “dirty” post, click here. And say hi while you’re there! Categories: Blogging, Blogs, Cool Stuff, Just Jot it January 2019, Life, Writing | Tags: annoying appliances, cold showers, Humor, inspiration, JusJoJan, writing novels, writing prompt | Permalink. It’s been more than a year since I secured (and paid for, twice so far) my editing website. I have a price schedule set out, and I have testimonials from a few authors. Like, people who would testify that I know how to grammar and everything. (Please don’t judge me by that last sentence. I’m joking.) And yet, I’ve been too busy–editing, mostly–to complete the website. I have return clients lined up who will potentially keep me working for the better part of the year, though I’m not precisely sure when they’ll call on me. But it isn’t only being busy that’s prevented me from setting up shop. My home life gets so chaotic sometimes that I’m afraid I won’t be able to keep up with the demands of the job. Which is a completely unfounded fear, because aside from the instances when my clients haven’t delivered their work on time, I’ve never missed a deadline. My own doubts are preventing me from expanding my horizons, so to speak. So that’s that–that’s all the news on that front. “Testify” is the prompt word for today, brought to us by Dan. Thanks, Dan! Click here to find his JusJoJan post for today. And say hi while you’re there! Categories: Blogging, Blogs, Just Jot it January 2019, Life | Tags: being busy, careers, editing, family, inspiration, JusJoJan, self-doubt, websites, writing prompt | Permalink.